Mongolians today value democratic government. In fact, for a country that endured 70 years of Communist rule, they took to democracy very fast. Why would this be so? Was it the influence of Western culture at the end of the 1980s? Was it Mongolians' own nomadic life, where nomads were free to come and go even when the government and class system were hierarchical? Or was it the Mongolian tradition of valuing democratic principles handed down to them by Genghis Khan? It was probably a combination of these three factors. "...Genghis Khan established these democratic principles 9 years before King John signed the Magna Carta..."
Chinzorig interviewing a herder woman, Tuv Aimag, 1998. The interviewed Mongolian citizens were asked to 'Please list the characteristics that make a country a democracy.' Their list of answers is not very different from that made by American students, as seen in the second column of the table below. 2. A multi-party system drives the democratic election process and representative (participatory) government. Rule by law prevails through the Constitution; the laws and courts are just/fair. 3. Human rights are protected. A multi-party system drives the democratic election process. 4. A free-market economy, including open competition and privatization, operates. Capitalism/market economy organizes the economy. 5. Rule by law prevails; government, laws, and courts are just/fair. The system of government is controlled through checks and balances. 6. Freedom of the media ("press") is guaranteed. Individual rights are protected. 7. Glasnost (openness in government and no government corruption) prevails. Government is of/by the people. 8. All are equal under the law and enjoy equal rights. Examples: USA, ancient Greece, Rome. 9. Humane, democratic society. All are equal under the law; equal rights are guaranteed. 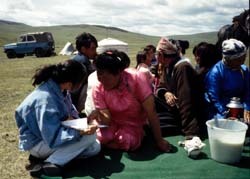 867 Mongolian citizens (Hovd, Ulaanbaatar and surrounding countryside) interviewed in the summer of 1998. 20 undergraduates and graduates at the University of Pittsburgh, 1994. All are American citizens born in the U.S.
"...Mongolians define a democratic nation in ways recognizable to us." The basic Western democratic principles are clearly seen on the Mongolian list. We can conclude from this that Mongolians define a democratic nation in ways recognizable to us. This is all the more interesting because Mongolians had been taught an entirely different definition of democracy when they were part of the Communist bloc. Communist democracy is economic equality. People are not equal unless they are equal economically - their dignity comes from sharing what they have. This definition can be found right in Karl Marx' Communist Manifesto. * And it was used in the Soviet nations, especially in the 1980s when people behind the Iron Curtain heard more and more about democracy in the West and wanted that kind of government also. Western democracy, on the other hand, stresses political equality. To us, democracy means that all people are equal under the law; they participate in their own governance and take responsibility as citizens for how laws are made and enforced. The Mongolians' list of democratic characteristics gives strong indication that they have switched to the Western definition of democracy within eight years of gaining freedom from Soviet control. There is nothing on the Mongolian list that suggests economic equality - equal distribution of goods - is a characteristic of democracy.